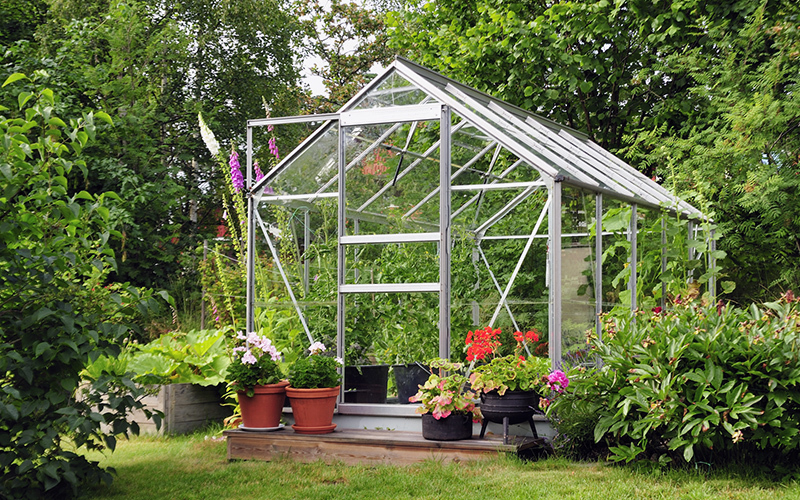 If you’re starting to look at Greenhouse Buying Guides, there’s a few things you should know. It’s similar, of course, to gardening outside. Plants still need adequate nutrients and water, and you still need tie, prune, and tend to them. But the greenhouse environment is also very different from that of a backyard garden. The very things that make greenhouse growing more controlled and convenient also make it more demanding. In a greenhouse, you control temperature, humidity, soil aeration, soil moisture and drainage, fertility levels, and light—but you don’t control everything. There are Pests And Diseases In The Greenhouse that require special care. And while a hight degree of environmental control offers a tremendous amount of latitude, it also means taking on some new responsibilities. Heaters, vents, and fans are your allies in temperature control. Even in a well-designed solar-efficient greenhouse, outside conditions are sometimes so cold and cloudy that auxiliary heat is needed to keep plants growing at an optimum rate. Vents and fans help to cool the greenhouse. On a sunny day, even at 20 degrees below zero, greenhouse air can heat up well beyond healthful levels. If the greenhouse is attached, you can move this hot air into your home. But in a freestanding unit, hot air must have a way to exit, and cool air a way to enter. Passive vents allow for this sort of movement, as do thermostatically controlled exhaust fans and intake vents. Manually operated vents are relatively inexpensive, but you’ll need to check them at least twice a day, and open or close them as necessary. Automatic ventilation systems are more costly, but they save time and reduce the chances of excessive cooling or heating. Adjust air temperature in the greenhouse according to the level of light. In general, summer crops grow best at temperatures of about 75 to 85 degrees in the daytime and 60 to 75 at night. On cloudy days, these temperature ranges should be somewhat lower, since the plant is not manufacturing as many sugars as usual. Winter air temperatures can go as low as 45 degrees at night without damaging most leafy green crops and shouldn’t go much above 65 to 70 degrees during the day. Spring seedlings vary in their temperature preferences. Cool-weather crops, such as broccoli and lettuce, grow most vigorously at 50 degree nights and 60 to 65 degree days, while warm-weather plants such as tomatoes and squash require nights at a minimum of 55 and days of at least 65 but no higher than 80 degrees. Ornamentals typically need night temperatures no lower than 55 degrees, and tender tropicals can require night temperatures of 60 or even higher. Investigate the temperature requirements of the plants you plan to grow before installing your greenhouse and heating system so you can match the heater to your plants’ needs. You can find a wide range of heater types and sizes, from freestanding propane heaters to powerful wall-mounted electric heaters. As with the greenhouses themselves, all greenhouse equipment is available through greenhouse and garden supply catalogs and Web sites. Air circulation is extremely important to plant health. Good air circulation strengthens the woody tissue in stems and decreases the opportunities for fungi to attack your plants. Dense plant growth can interfere with air circulation and contribute to excessive relative humidity. Leave adequate space between plants and prune so that leaves from adjacent plants don’t touch each other. Plants use carbon dioxide from the air to manufacture sugars. In a closed greenhouse, carbon dioxide can be so depleted that plant growth is slowed. Remember to ventilate to change the air supply at least once each morning, even if you have to add extra heat. Besides vents and fans, one low-tech way to increase air movement is by installing screened windows and doors in your greenhouse. By opening a window on one end and the door panel on the other, you’ll have cross-ventilation. Positioning windows at the top and bottom of the greenhouse walls allows warm air to rise and escape from the upper windows, and cooler air to enter through the lower ones. Greenhouses that feel like rainforests don’t produce sturdy, healthy plants. Relative humidity should be close to 70 to 85 percent during high-growth periods. At levels of 90 to 95 percent, plant growth is weak, early bolting occurs, and fungal diseases become a real problem. Decrease humidity levels by venting or exhausting humid air and watering only when necessary. Growers in arid climates can increase humidity levels in the greenhouse by spraying water on the floor. Light levels in a greenhouse are partially determined by the design. When planning a greenhouse, check shade patterns from roof overhangs at the summer solstice in June and modify the plan if the shade is too great. Fluorescent lights are very useful when you’re growing spring seedlings, particularly in cloudy regions. They can also give a boost to midwinter greens and the last of the fall-fruiting crops. Ornamentals will also be healthier and more attractive with supplemental lighting. Shop-light setups suspended over raised benches are easy to install. You can choose fluorescent bulbs designed for plant growth, bulbs that mimic sunlight, or simply pair cool and warm bulbs in your fixtures. For intense light in a smaller area, another option is a compact fluorescent setup. For plants like sun-loving orchids and tomatoes that require the equivalent of direct sunlight, you can also set up HID (high-intensity discharge) lighting systems with special bulbs. These systems are costly, though, and tend to give off a great deal of heat, so they’re typically used by specialists and professionals rather than people with home greenhouses. Most plants will do fine with typical greenhouse light and supplemental fluorescent lighting. Whatever system you choose, adding a timer will give you control over the amount of light your plants receive without having to worry about turning the lights on and off manually. Timers can also control automated watering and mist systems, fans, heaters, and other equipment. Don’t forget that plants can receive too much light as well as too little, especially in summer. Special greenhouse shade fabric panels are available in many sizes, as well as lengths you can order or cut to fit. You can choose from screening fabrics that will provide light shade to heavy shade, or protect plants from both too much light and heat buildup. Typically, you attach them over the greenhouse roof, though in areas of intense light you can choose a size that will cover the upper part of the walls. Another option is to use shading paint developed for greenhouses. You can find paint that dries white, but becomes transparent in rainy weather to let in more light. Make sure you choose a paint specially developed for greenhouses so you can wash it off before winter. Commercial growers sometimes amend the soils under their greenhouses and plant right in them. Home greenhouse growers usually find it easier to use benches with individual pots set on them or growing beds filled with a soil mix. Soil mixes for containers, benches, and beds should be lighter and more fertile than most garden soils. Good soil mixes drain fast, hold moisture well, contain balanced and slow-release organic nutrients, and have a slightly acid pH. If you buy a potting mix, make sure you choose one that’s organic. There are many options available in garden centers and from garden supply catalogs and websites. If you choose to make your own potting soil, a basic recipe is 2 parts soil, 2 parts finished compost, 1 part peat moss, and 1 part vermiculite or perlite. If the soil is clayey, add sand; if it’s too sandy, use vermiculite instead of perlite and increase the proportion of peat moss. Test the pH and adjust it if necessary. Add compost and other amendments such as vermiculite each spring and fall. Good mid-season fertilizers include compost tea and side dressings, earthworm castings, liquid fish emulsion, and seaweed. Foliar feed plants by spraying leaves with dilute compost tea, nettle tea, or liquid seaweed for extra nutrients and some disease resistance. Fertilize less in winter, when cool soil temperatures inhibit microbial activity.